Normally self-service for breakfast is something I would like but a change had come over me during this trip making me lose the small morsel of self-control I thought I had. We were first shown to a huge long table in the serving area holding hotplates overflowing with sausage, bacon, eggs and all the other foodstuffs we had eaten continuously and in great quantities during the previous 8 days. Before I knew it I had skilfully piled the maximum amount of food onto my plate and shuffled back to my table in the conservatory area at the front of the building. We felt very relaxed and civilised as we scoffed down the fried fare and topped up our caffeine levels. For the first time on the trip we had awoken to blue skies and bright sunshine and we felt positively upbeat as we paid the bill and put on our boots on the front steps of the Lodge. 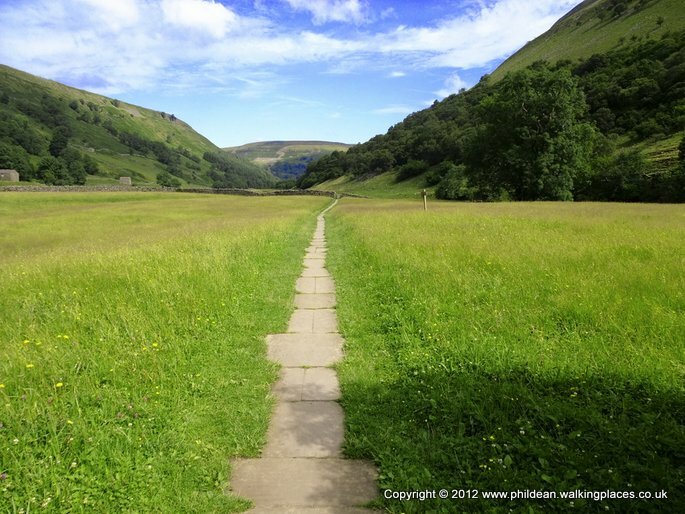 We knew that today was a relatively easy day being just 11 miles but there was still a choice to make between upper route as described in Wainwrights book or the lower Swaledale Valley alternative. Now neither Nige nor I are academics and walk to relax, chat and enjoy the scenic surroundings. To us it was a bit of a no brainer. Whilst the official route may have shown us lots of interesting (?) remains of the lead mining era we really couldn’t be bothered thinking about more than putting left foot after right and spouting our usual gibberish so we went for the more scenic choice. This meant we could take it easy and, for the first time, make a voluntary detour to look at some of the scenic villages just off route. 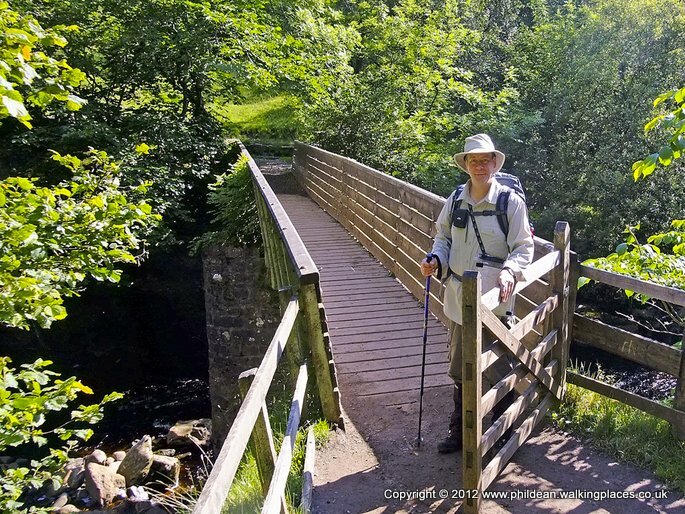 We dropped down through the pretty village of Keld and took the bridge crossing East Gill Force. After a short while we caught up with Sue and Merv and their new walking companions but left them as the path split for higher and lower route. 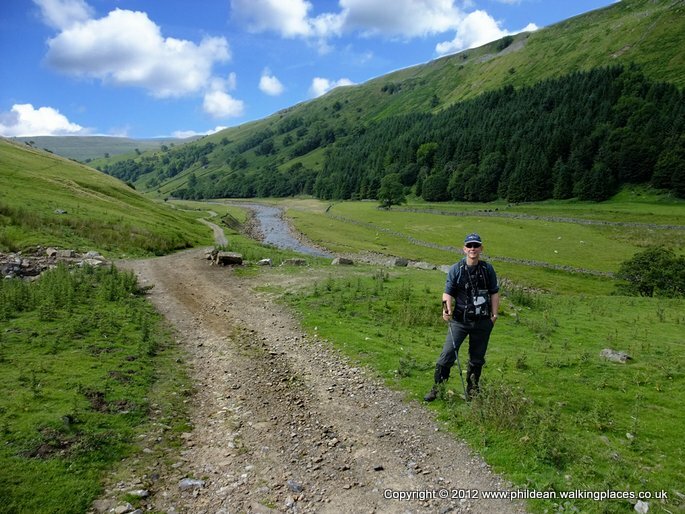 We took the lower route but left it fairly quickly at a sign post pointing to Muker. 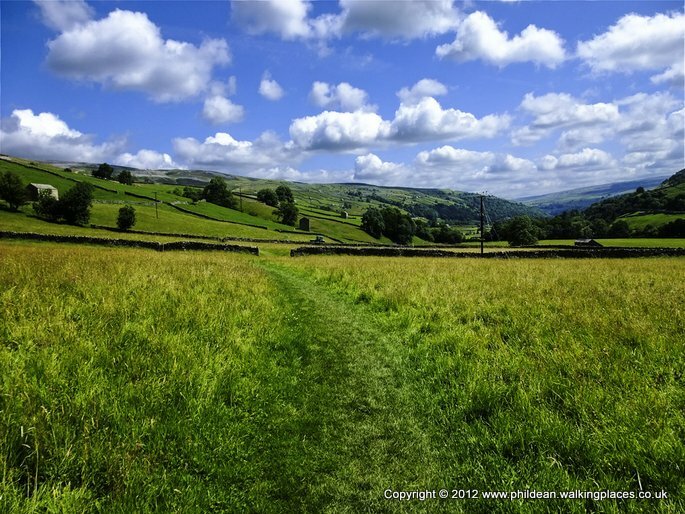 For the past 10 years I had visited the Yorkshire Dales approximately once a month with a small group of ex-colleagues so it suddenly felt like familiar territory as the valley floor widened and the stone walls came into view. 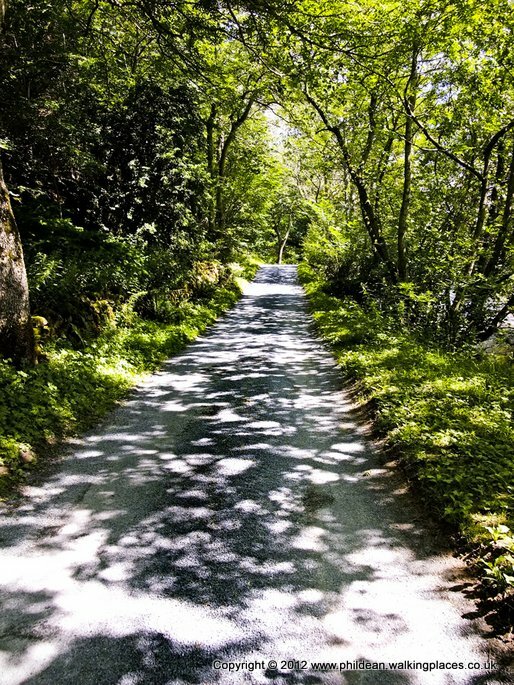 The sun really added to the moment as we took the paved path to the village. Muker itself was pretty with a few craft shops and cafes but didn’t have a lot to distract the long distance walker. However, we felt as though we should spend some time to explore and pad out our day so we found a place selling ice-cream and sat on a bench to relax. After 5 minutes of inactivity we decided it was time to get back on track so we retraced our steps across the fields and ambled along the path in the direction of Gunnerside and the Kings Head where we planned to have an (early) lunch. It was hard to purposefully walk slowly but we did our best and took lots of photos of the beautiful surroundings. We ordered lunch at the Kings Head in Gunnerside and whilst waiting for it to arrive managed an ice cold pint of lager shandy each. The food did take ages to arrive but we were in no rush and decided to have another drink to wash it down with. By the time solids and liquids had been consumed we felt totally relaxed until, that is, Nige looked at his watch. It was past 2 O’clock and we still had over 9 miles to walk. The atmosphere changed as we threw our packs on and set off at breakneck speed up the road to find the path that would lead us to Reeth. At this point we realised we had taken it a bit too easy and also why we hadn’t, up to that point had an alcoholic drink during the day. Our legs felt like lead and the damn sun wouldn’t stop shining. We ended up getting a bit lost and at one point dropped down a very steep field, climbed a barbed wire fence and found ourselves on the road at lot sooner than we should have. We diced with death on the bends but eventually came off to follow the Swale into Reeth. We approached the town from the back through some narrow lanes and alleys between buildings which by chance brought us out right by our digs for the night, Hilary House. This establishment was run by a middle aged man who lived with his elderly parents. We got a very friendly welcome and shown to our room. 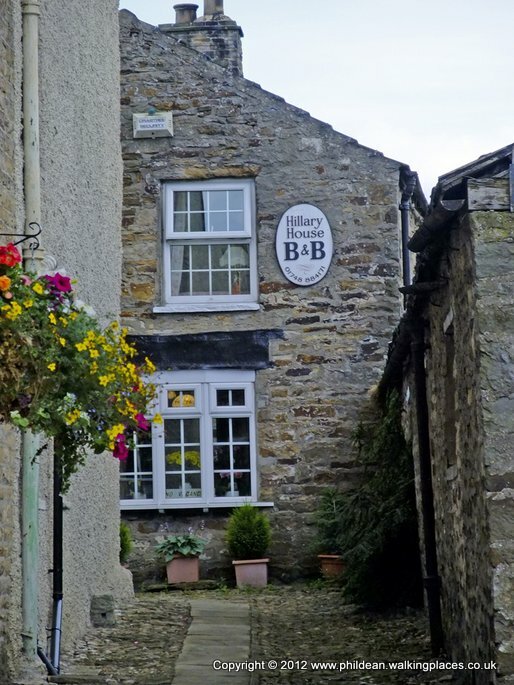 It seemed a bit strange that we were to share the family bathroom but we showered and changed into something moderately clean smelling and went to discover the delights of Reeth. 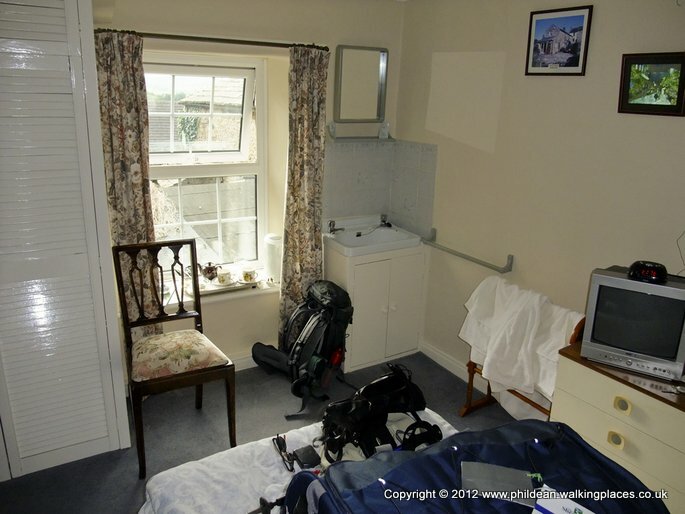 That is we would have done if the landlord hadn’t been quite so chatty. We must have stood for over 20 minutes learning all about his families medical issues whilst listening to a dog scratching at the door desperate to greet us and a very loud screeching parrot that sat covered in a cage in the corner of the lounge. Eventually we manoeuvred ourselves out of the door and strode briskly into the square to find somewhere to eat. 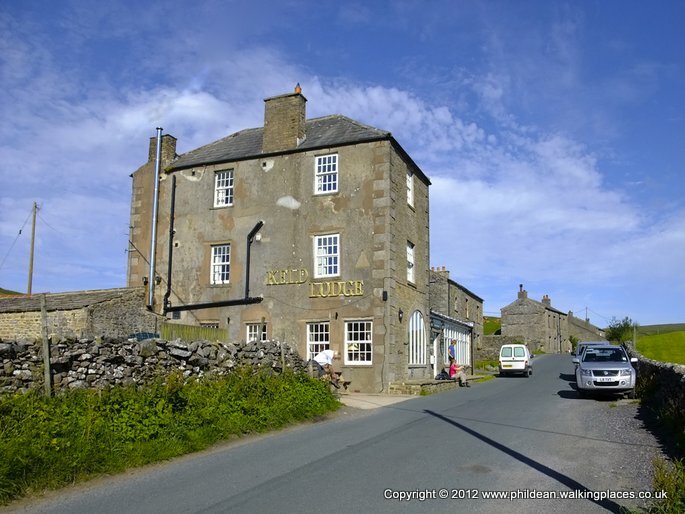 Got to say that Reeth was a big disappointment as regards pubs and eating places. The buildings all looked nice from the outside but once in they were tired and run-down. We ate a pretty poor meal and tried a few different pubs to keep to the quota but it wasn’t one of the best nights of the trip and by 10:30 after listening to a few more medical stories we collapsed into bed ready for the following days challenge – an easy 10 miles to Richmond on which we were going to be joined by an old friend of ours, Tony. 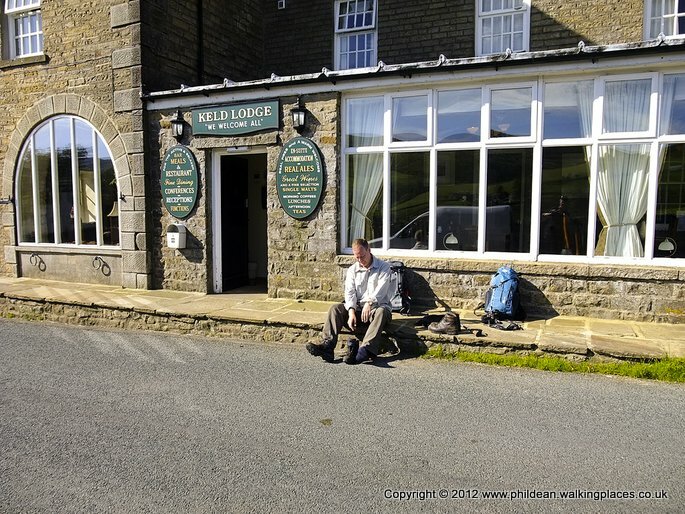 Keld lodge was a great place to stop - all the people we had met over the previous 9 days were staying there and a few we'd never seen up until now. It all led to a raucous session in the lounge and seriously upped the beer / whisky count ! Breakfast was in the conservatory in the front of the renovated youth hostel and the sun burst in in a way we hadn't seen before - way too bright for sensitive eyes. Self-service meant even more meat and egg to eat than usual - no self-control whatsoever. Nige and I discussed such things as how many days our sock or undies had left before they needed to be bin-bagged or destroyed but behind us sat a young couple discussing Shakespeare in great detail - how disgusted they must have been with their breakfast companions. 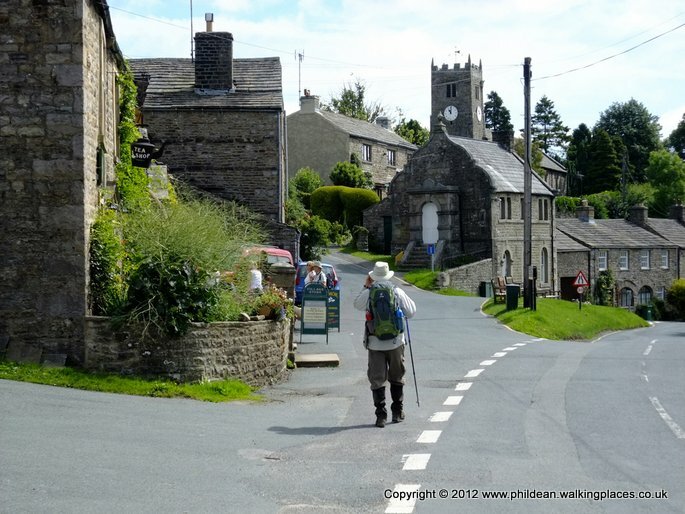 Today’s walk was billed as an easy 14 miles through the swale valley following the river and taking little detours to discover the quaint yorkshire dales village. We were warned the danger with this section was that we could arrive at your destination too early. Nige and I took this too literally and walked so slow that someone passing asked us if we were alright !. We took detour to Muker for cold drinks and ice cream. We then strolled slowly through the glorious countryside to Gunnerside where we both had huge ploughmans lunches. By now it was 2pm and glancing at the gps we realised we still had over 9 miles to go ! Suddenly we moved into route march mode but staggering under the weight of lunch and general feeling of needing to lie down and sleep, we got lost and a bit frazzled. 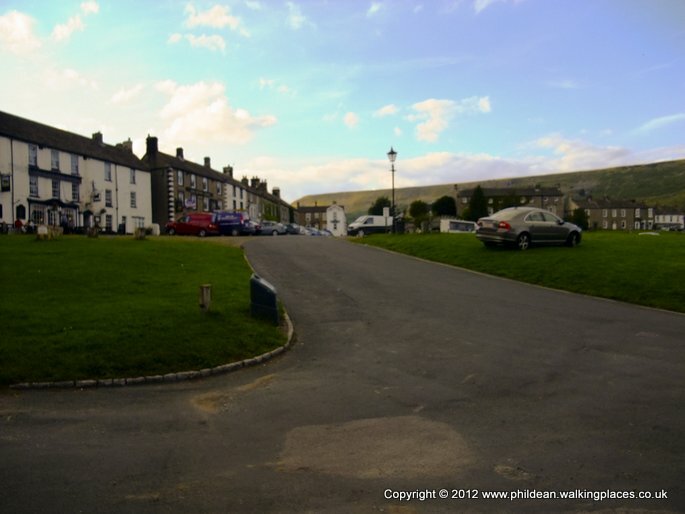 Eventually we ended up in Reeth which looks really nice when you arrive but is actually a bit of a dump when you start going in the shops and pubs. In the pub we ate in the waitress had an expression just like Niges' sea bass ! Add 4 more beers and 1 whisky to beer count.